However, in all seriousness, after receiving the product for free from Amazon, I thought I would give you my honest and un-biased opinions on this cream. The company claim that the cream is a ‘powerful solution uniquely formulated to help you achieve younger-looking skin’ and it does. Resisting the urge to use it under the bags under my eyes (younger looking skin is much needed in this area), I found that when rubbed into my legs, it made them feel smoother and hydrated. The cream is easy to apply and comes in quite a large tub. However, the tub suggests that for the best results it should be applied twice a day and that results should be visible after two weeks. At £23.95 a tub, it is an expensive cream to be using twice a day. The question is: is it worth it? 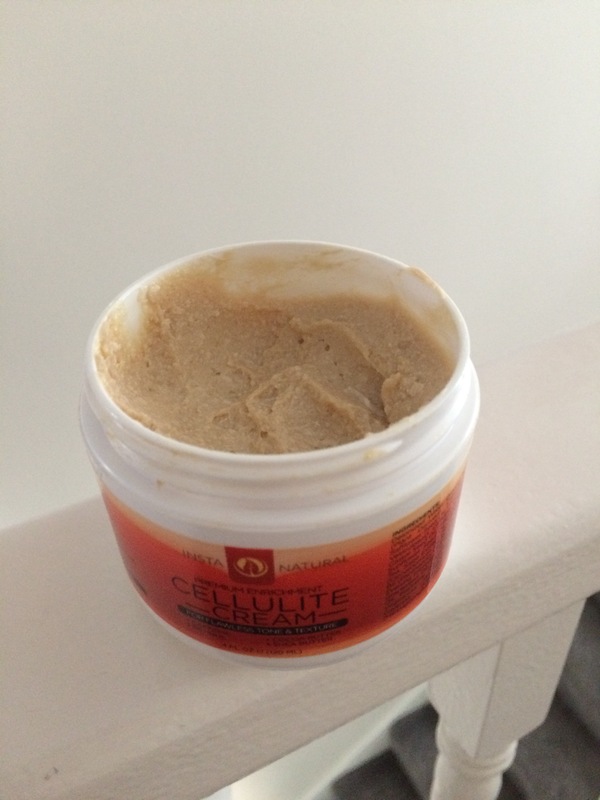 Cellulite is one of those things that everyone gets but nobody wants. 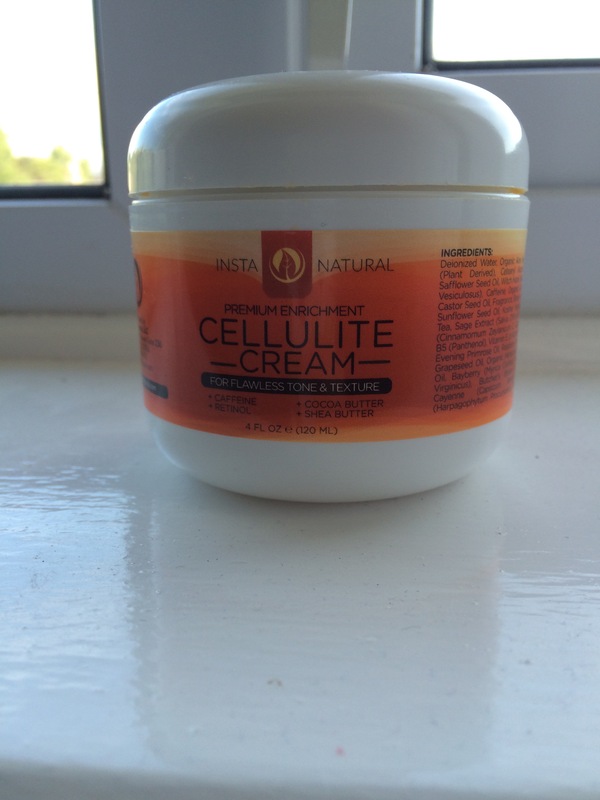 InstaNatural are now promoting their new cellulite treatment cream, enriched with ingredients that have been proven to help deal with the appearance of cellulite: caffeine, retinol, vitamin C and B5, cocoa and shea butters, as well as anti-oxidants. I have tried it not only in the hope that my vigorous rubbing in tactics might make up for any form of exercise that I should be doing, but it could also help with keeping the skin firm. The cream has an unusual texture and colour (it almost looks like a mousse), which I can only attribute to the fact that it’s all made with natural ingredients. It spreads well and is easily absorbed by the skin and it can be used in all sections of the body that can develop that cellulite orange peel aspect. I have even put a little on my arms in the hope that my once toned (and I am using the term ‘toned’ very loosely here) may return. I have started using it mostly on my legs and I’m hoping that by continuing the treatment, it will improve their look. I haven’t been using it for long but for now, I can say that my thighs feel firmer and better hydrated. You can feel the cream on your skin all day. As I have previously said, the cream is quite thick and made from natural ingredients. This means that is also has a strong smell. It is not unpleasant in any way (it’s a little like fake tan), but as the cream stays on your skin all day, so does the smell. The application of the cream is simple: you rub it into clean dry skin twice a day and ensure that it is completely adsorbed. You must make sure that the cream is allowed to dry before wearing clothes as it may rub off. If you’re a busy mum, then I suggest doing a couple of chores whilst waiting for the cream to dry. This morning, for example, I changed the boy’s nappy, shouted down stairs to the Other Half and asked him to put the kettle on and brushed my girl’s hair. Voila, after five minutes I was dressed and ready for work. Well, not ready for work (I had a million and one other jobs to do), but dressed at least! If, like me, you have had trouble shifting the extra baby weight, the I recommend this cream. Yes, a healthy diet and exercise is what is needed to lose weight and, more importantly, stay healthy and fit. However, if you need a quick confidence boost and you like the feeling of smoother and firmer skin, then I suggest you give this cream a go. Ahh! This sounds like great stuff!